Sometimes I can't believe time goes on with such a constant flow that it leaves me in the dust. Its been a hot minute since my last post but a lot of things have come and gone since February. SXSW was a great time, I got a new promotion at the day job, but more importantly, I have been creating more content. I often find myself creating but lack when it comes to sharing it with you all on my site. So, I am excited to share with you all this new Creative Hangs Installment. As you may remember I have previously collaborated with Yarisel Estrada a local creative living in Austin, and since then we have kept in touch. Yarisel introduced me to the H Collective or "The Hub". The H Collective's goal and mission are rooted in bringing creators together through their site and have recently partnered with brands to hire members of the collective amongst other partnerships. One of these partnerships was with Red Line The Magazine. Photographers and models were tasked with creating imagery that incorporated the color in any way shape or form and the winners would get flown to NYC for the launch of the Magazine. So when Yarisel informed me about this collab I was down. We brainstormed ideas for the shoot, location, space, aligning schedules, and decided we wanted high contrast. Spring was in full swing in Austin so the idea of photographing outside and incorporating natural elements was an interest of mine. 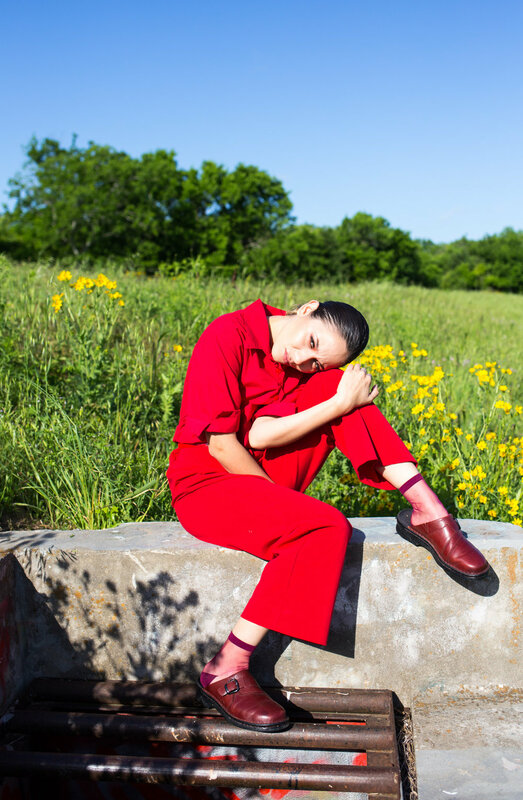 The styling for the shoot was done by Yarisel and we agreed on a red jumpsuit look that would hence incorporate the red theme. We were really fortunate to have been able to partner with traveling MUA Madelyn Michael. Madelyn further enhanced the red theme by incorporating the color into the makeup she applied on Yarisel for the project. With the styling and the makeup covered It was up to me to deliver on a unique location. We woke up early on the day of our shoot in an effort to work under subtle morning light that wouldn't be harsh on Yarisel, but you can only plan so much and the end of the day you have to work with what you have. We arrived at a location in south-east Austin close to a spot I had grown up at. My teenage years were full of skateboarding and exploring so I had a pretty good spot in mind. As we walked up to the spot I could already see the yellow wildflowers from afar. I wanted to use the primary colors to my advantage to create a well-defined contrast. Yarisel's look incorporated the red, the blue skies served as our backdrop and the yellow flowers would create a separation between the other two colors grounding the imagery to that natural approach. Although the light was harsh when we got to the location it served as a modeling light and really added vibrancy to our imagery. We photographed for about 30 minutes and created some really solid work we were all happy with. The post-production of the imagery was subtle but I did decide to create a more aged look by adding a bit of grain but aside from that the images are pretty true to what we saw out there. I hope yall enjoy the work and thank you for stopping by! Big thank you to Madelyn and Yarisel for sharing their passions with me and making this work possible! Be sure to check them out and if Y'all have any questions please feel free to reach out!